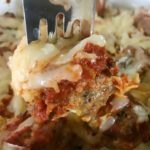 What makes this lasagna Traditional Canadian Lasagna? 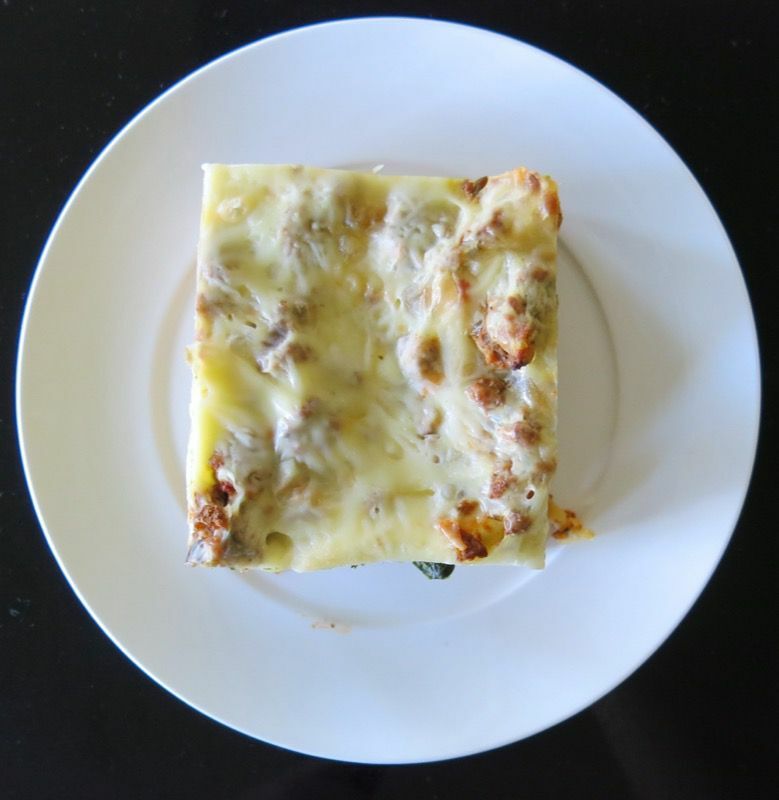 I haven’t made this recipe for so long, but I will be doing so much more often as it is a throwback to my childhood and the lasagna recipe all mothers made when they made homemade lasagna on the Canadian prairies. Now, I tried to research which box this recipe first came out on, and could not find any definitive answer, but I recall seeing it on the box, myself, as a child, on the blue Catelli box. It was the only pasta mom would buy, and a Canadian company since 1867. However, I could find no information about when the recipe first appeared on the side of the lasagna noodle box. 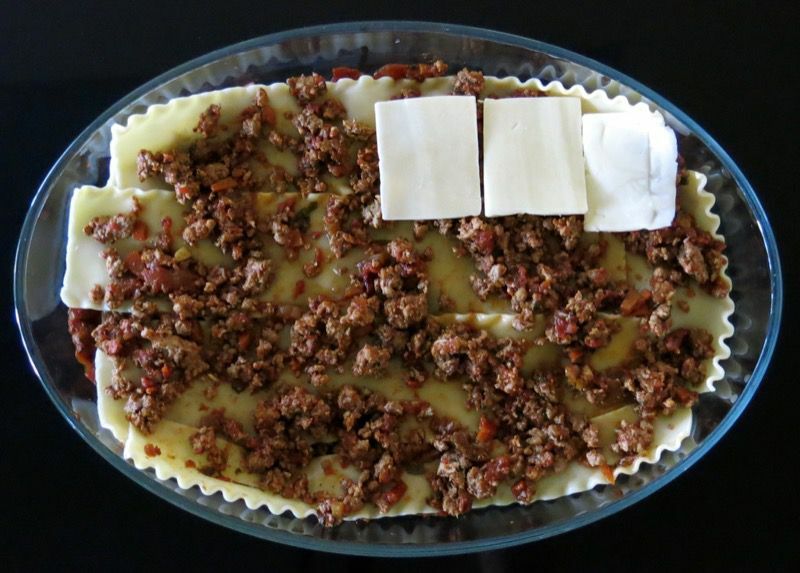 So, What makes this lasagna Traditional Canadian Lasagna? 1. 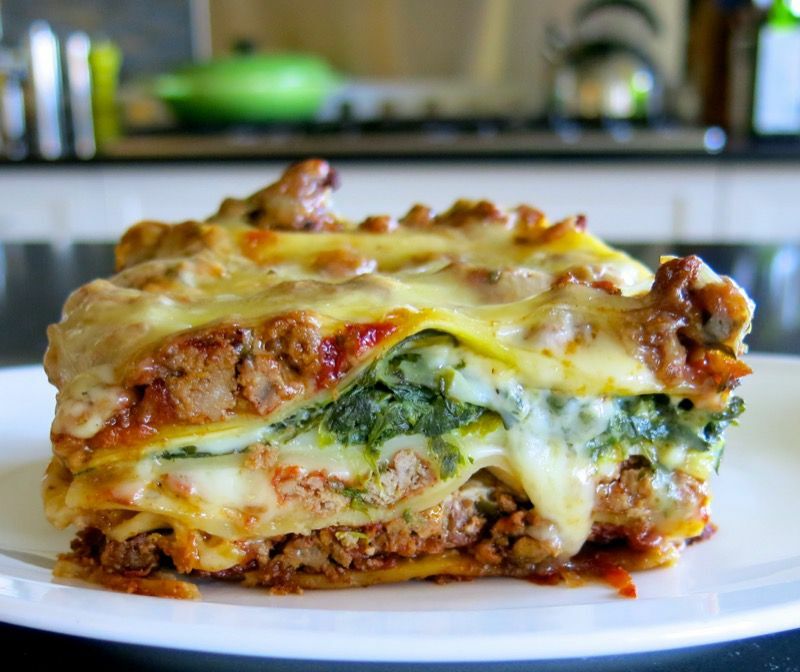 You would never find lasagna like this anywhere in Italy. 2. Whoever developed the recipe, did so for the Catelli company, and used ingredients that were easily accessible to most Canadians at the time. 3. The pasta is from a Canadian company and made in Canada. The “Italian Recipe” was a game changer. 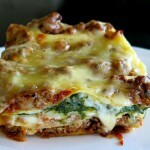 Suddenly, everyone was making homemade lasagna with a spinach and cottage cheese layer. No one knew of any other kind of lasagna at that time, anyway. This was all we knew. 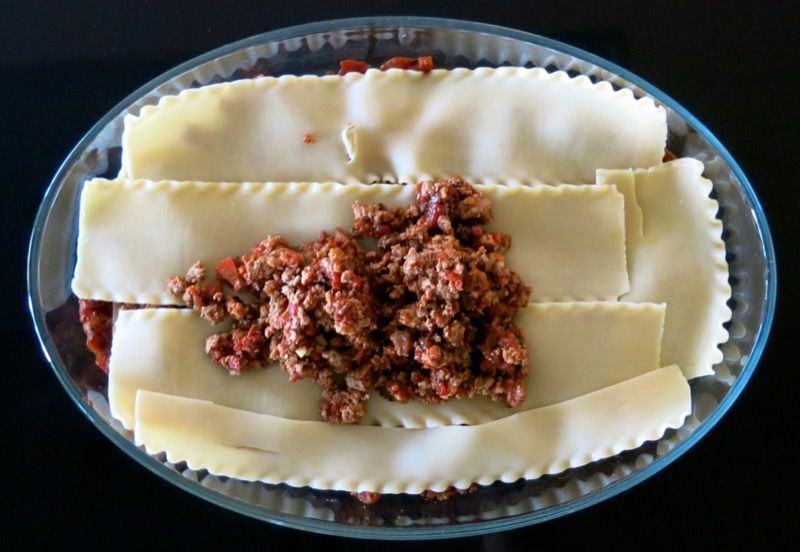 It was very expensive to make, due to the high cost of the cheese, and the fact that at that time, a Canadian woman had to put almost a one inch layer of the meat sauce between the pasta layers. This was a dish people made for a crowd and on special occasions. Anyone else share my Traditional Canadian Lasagna memory? My daughter was just at a friend’s the other night, and she was making this very recipe for her family. That is what motivated me to revisit the retro recipe, and the only lasagna recipe any of us knew for so long. Catelli was founded the same year as Canadian Confederation: 1867. C. H. Catelli established his first plant in Old Montreal initially selling food sauces to local Italian immigrants. In 1908 the Catelli Company became a limited company under the name C. H. Catelli Limitee and moved into a three-storey plant on the north end of Bellechasse street three years later. C. H. Catelli retired in 1918 and the company was reorganized in 1928 under the name Corporation de Produits Macaroni Catelli Limitee, changed again, years later to Produits Alimentaires Catelli Limitee-Catelli Food Products Limited: the name we are familiar with today. The present day plant at 6890 Notre, Dame Street East was purchased in 1939. And, there are now also plants in Ontario, Transcona, Manitoba and in Lethbridge, Alberta. Catelli has grown to one of the most important pasta products manufacturers in the world. No wonder a recipe on the side of the lasagna noodle box changed the Canadian food culture in my neighbourhood, oh, so many years ago. A highly flavoured homemade tomato sauce is key to any great pasta dish with tomato sauce. 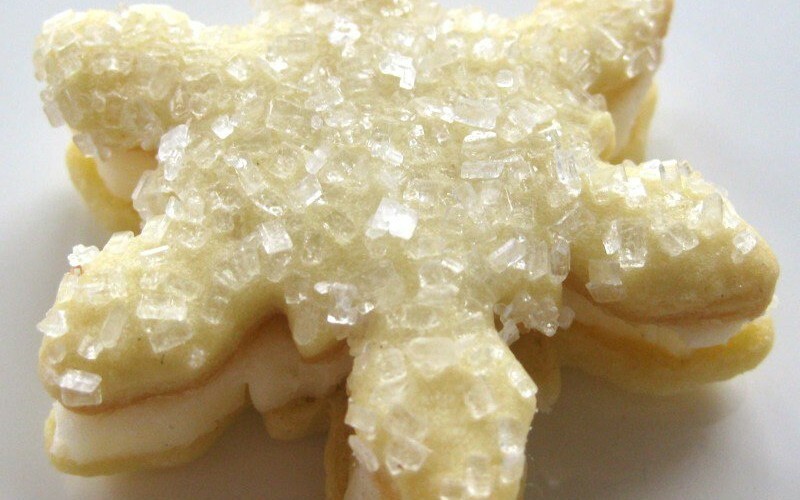 I learned how to make this years ago and always have a batch on hand. 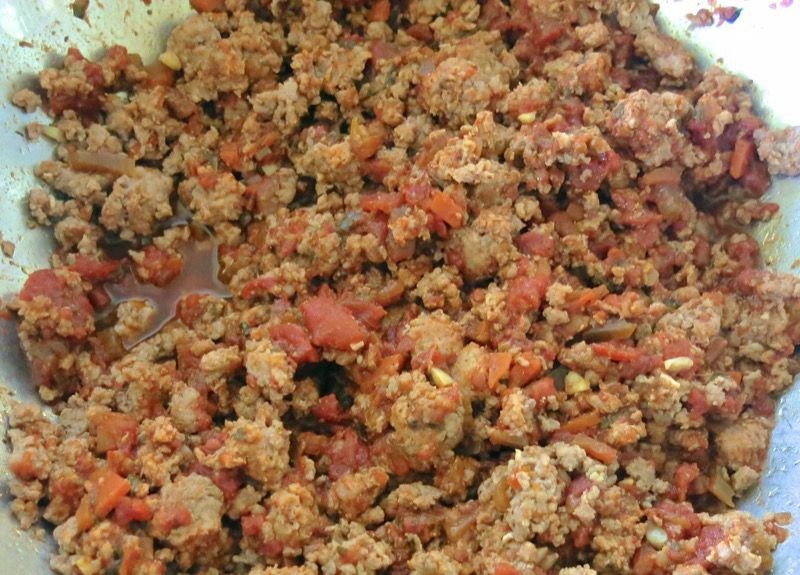 When I want meat sauce, I season and brown the meat, adding the sauce. Ricotta Cheese didn’t exist in grocery stores at the time this recipe appeared on our family table. 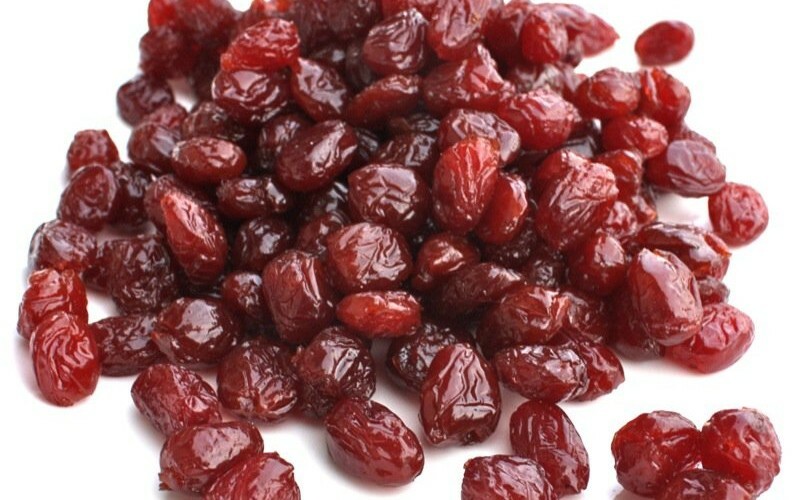 However, cottage cheese was common and a perfect substitute. I still prefer it in my lasagna. 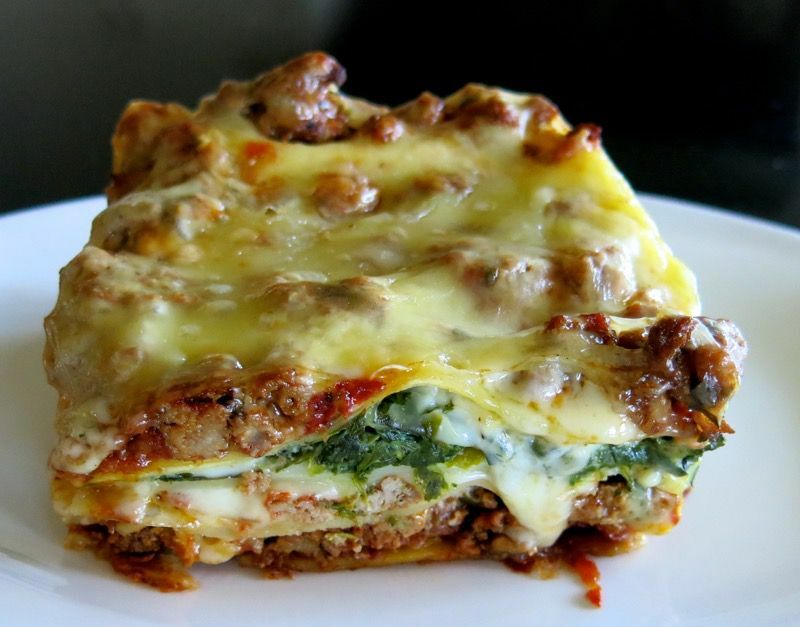 Not sure how the spinach found its way to the recipe, but it is so flavourful and offers such contrast to the meat filling, that I cannot imagine any Canadian lasagna without it. After the fillings are ready, the pasta is cooked and I find parchment paper works well to keep the pieces from sticking to one another. If you look carefully, you will see a scant layer of tomato sauce under the pasta, above. The pasta is then topped with a scant layer of meat sacue. I found a cup to a cup and a half was perfect for each layer. The dish opened wider to the top, so each layer needed a little more sauce. I started with a cup. Layer 2, above was about a cup and a quarter of meat sauce. This layer was covered with generous slices of cheese. There are two cheese layers. 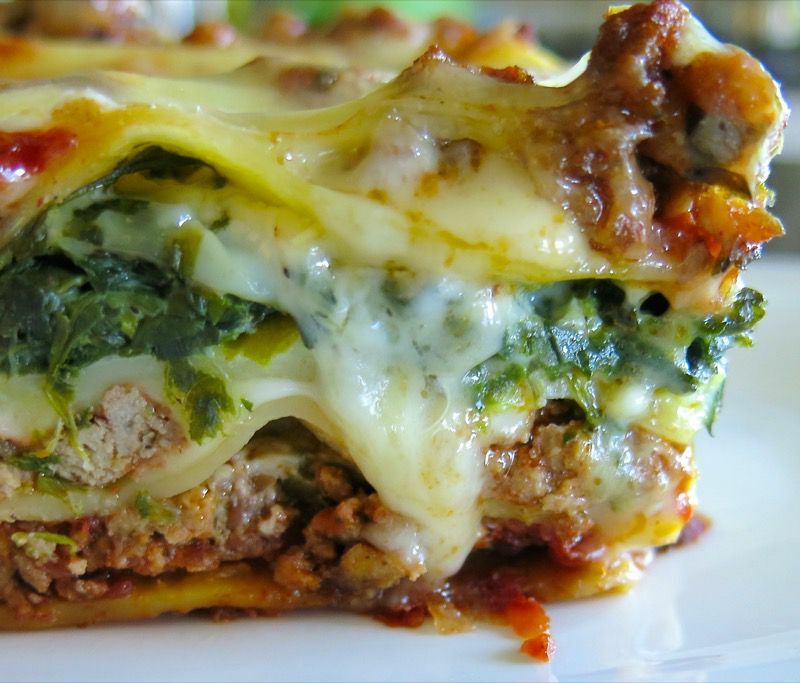 One here, just below the spinach filling layer, and one topping the lasagna. The spinach layer is next. Don’t scrimp. Some recipes will call for half this amount of filling. You need it all. 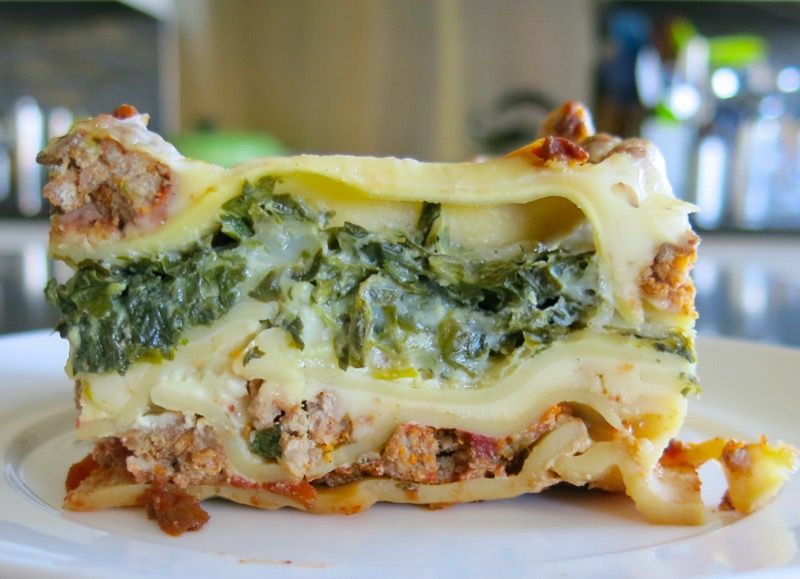 Spinach layer is covered with pasta and the third meat layer. This is the top, depending upon the height of your casserole dish. 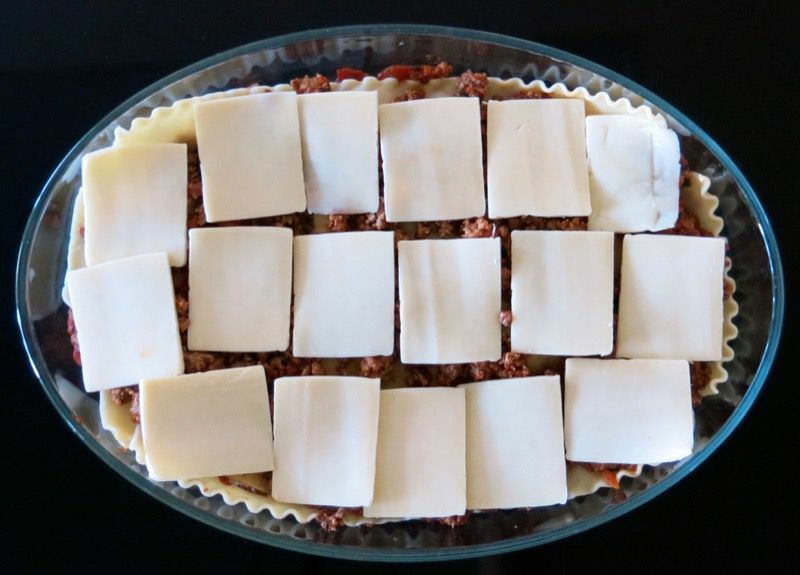 If you have a deeper dish, cover the third layer of meat with pasta and do a fourth layer on top, covered with cheese. At this point, you can freeze it, or bake it. I do both, because I always make two. One to bake and one to freeze. It slices so beautifully if you let it sit for 30 minutes after coming out of the oven. That may seem like a long time, but that is how long it takes to set. It will still be plenty warm. And oozing with cheesy meaty tomatoey goodness. I don’t think I’ve met a lasagna I didn’t go gagga over, but this one spells H-O-M-E. No other lasagna does that. This is definitely a Canadian recipe as I Personally recall seeing it on the side of the blue Catelli box, myself, as a child, on . It was the only pasta mom would buy, and a Canadian company since 1867. However, I could find no information about when the recipe first appeared on the side of the lasagna noodle box. The meat sauce and tomato sauce in this recipe are not the recipes on the side of the box. The idea and process is the same. 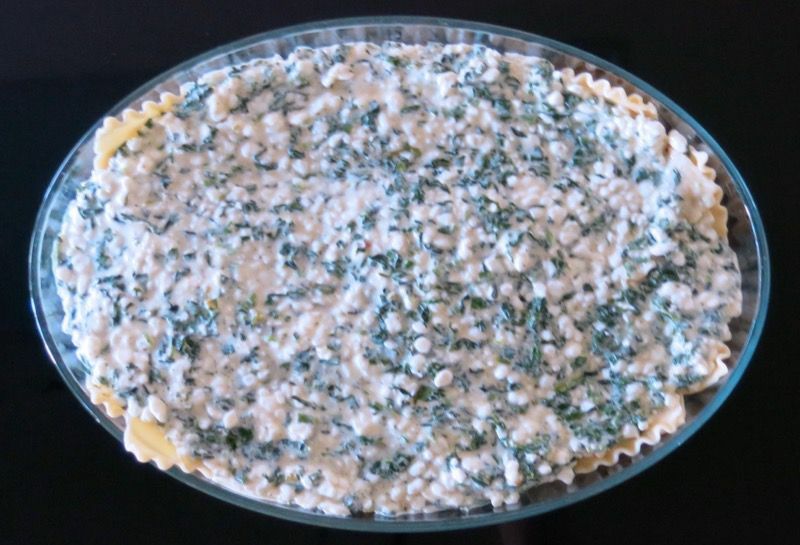 The cottage cheese and spinach layer is key to the Traditional Canadian Lasagna, as is the mozzarella and the meat filling layers. If you have lots leftover and don’t want to serve it again, slice pieces, wrap and label well. They will freeze individually beautifully and reheat as if made fresh. Another miracle. That is the perfect lasagna for me, I love it!! Drooling!! 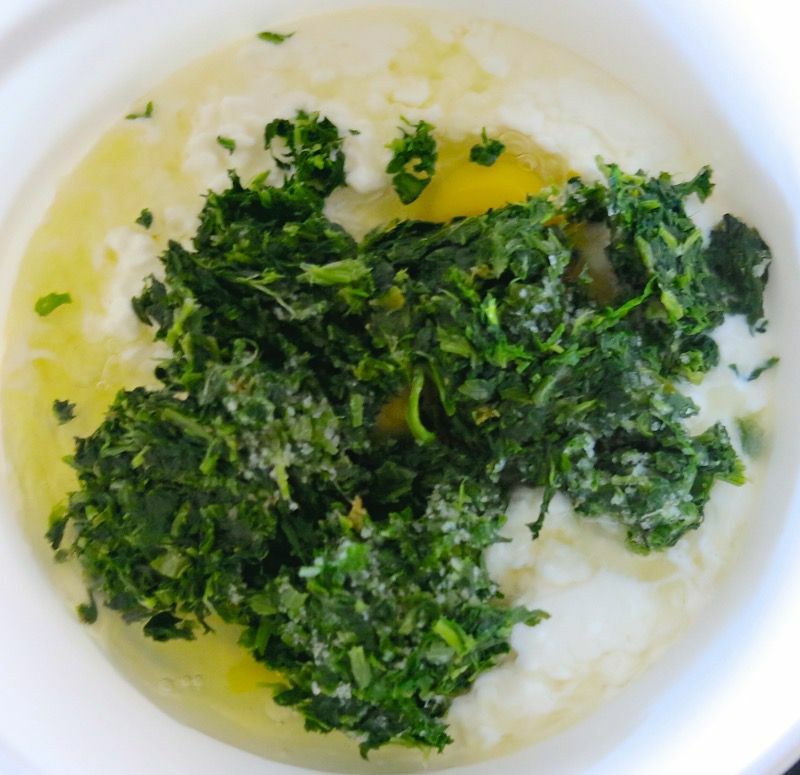 Have you ever had this one – with the cottage cheese and spinach? 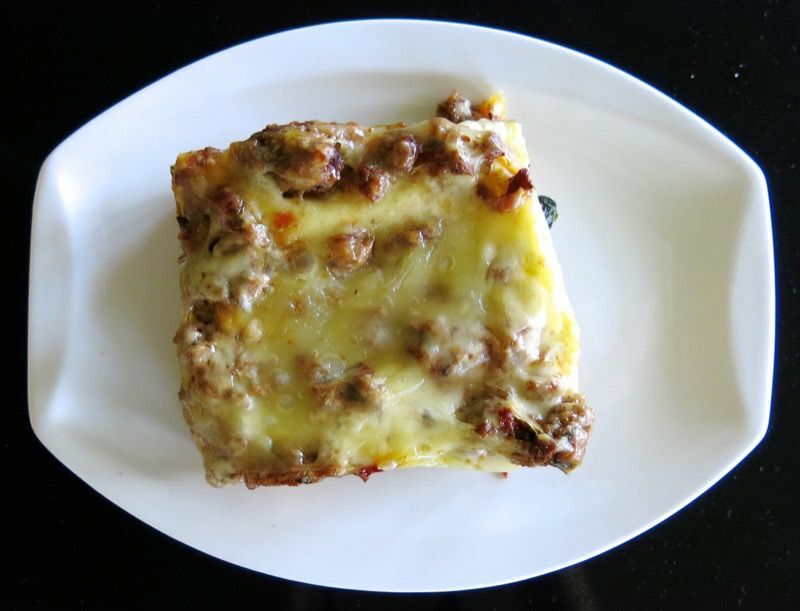 I know you are a generation (or few) younger than me, but this was really the first lasagna that anyone in our neighbourhood or town or I will even say region knew for years. 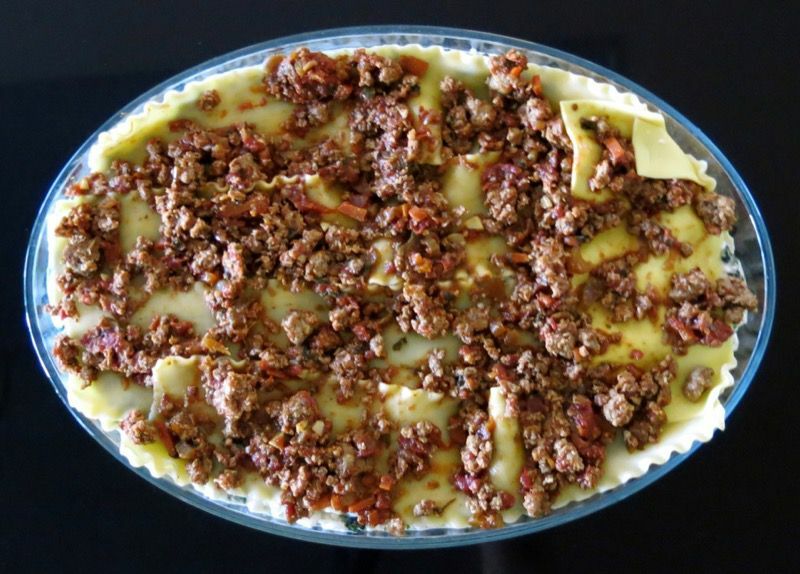 This recipe is, coast to coast, without a doubt, Canadian lasagne. 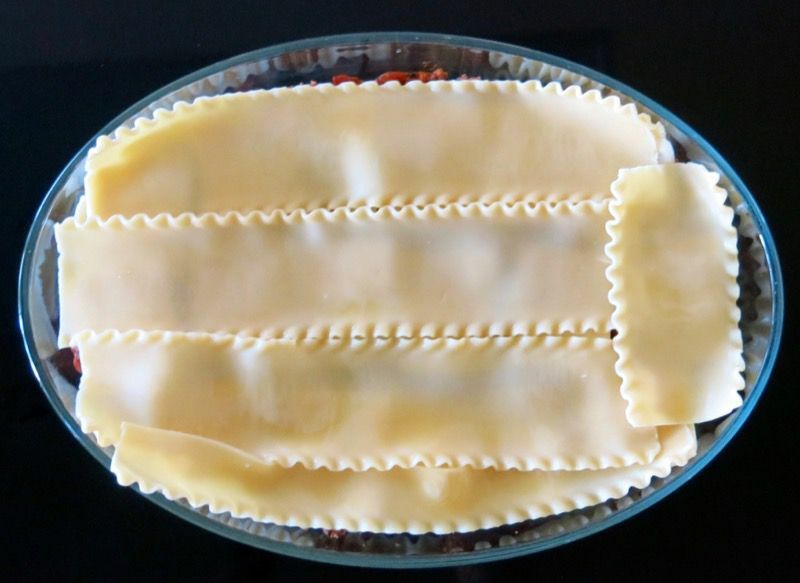 Growing up on the Atlantic, it’s exactly what I identified as lasagne until I worked abroad at an Italian resto in Melbourne in the summer of ’98. Since then, if I’ve learned anything, it’s that everyone’s lasagne is different ( from noodles to sauce to inclusions) and everyone’s Nonna’s is the best! Unless it is *ahem*, ‘lively discussion ‘ you are after, don’t discuss or debate, just mangia. But, out East, blue boxes did not mean Barilla, Catelli was THE only pasta available and ricotta was an exotic, unavailable ingredient. This is cheese-covered comfort food reminiscent of home for sure. I wonder what the in-laws would think of it? I’m sure lively discussion would follow! How wonderful to hear from you, Mary! 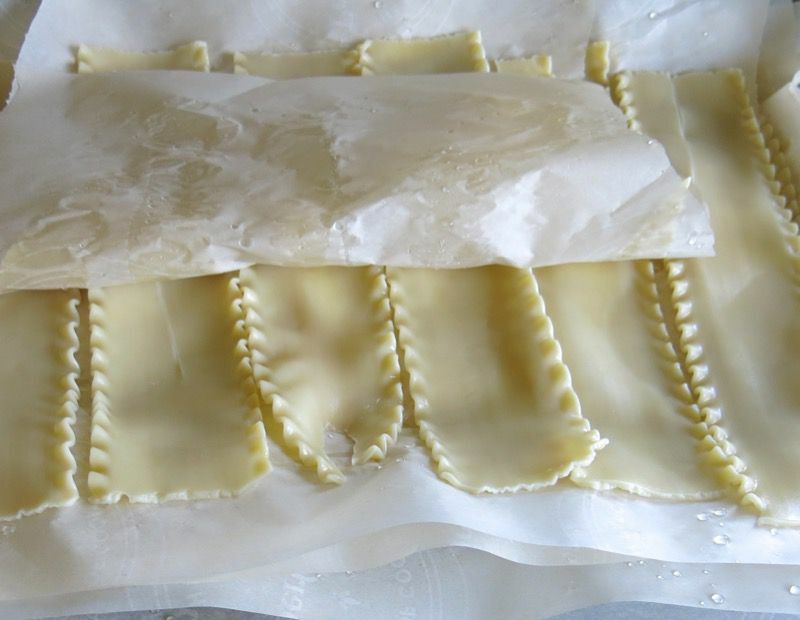 Jens and I just got together Saturday to make Agnolotti del Plin. It was a wonderful day. 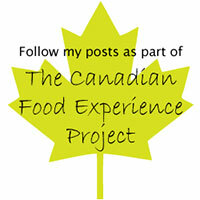 Isn’t it so true how our Canadian food culture has changed? It was gratifying for me to find you had the same Traditional Canadian Lasagna out East growing up. And as you have married into the Italian culture, the food culture your children learn to know as traditional and home food will be so vastly different than ours. I do wonder what your inlaws would think of it, for sure!! Big hug to you and happy happy 2015! Just like my mother’s and grandmother’s -excited to find an official recipe! By the time it got to me, it was always a little of this and then that, so maybe finally I can reproduce! I love the background to the recipe, it explains a lot. I always loved the cottage cheese but wondered as an adult why that was used. Such a comfort food. Thanks so much for posting. So wonderful to hear from you! I confess, the recipe isn’t the exact one on the box, but the idea is the Traditional Canadian Lasagna. The spinach layer on the box had 500mL cottage cheese and 2 eggs. I don’t recall the meat sauce recipe, but I am certain we all followed it exactly, at the time. You know, I still recall the very first time I tasted Italian herbs. They came in a package with a homemade Chef Boyardee pizza kit. There was the package of dough (add water and press into the pan), the sauce (spread over the dough), the cheese (sprinkle over the sauce, and it was stinky – first experience with parmesan cheese, too), and the herbs in a little plastic packet to sprinkle over the entire lot – then bake it. OOOOOh – boy – was it tasteee! Now, I just laugh. The flavours were SO foreign to us all at that time (1960’s). I can hardly wait to try this but I only could see half the instructions. I think I figured it out but could you e-mail me how long and at what temperature to cook it. I repaired the recipe. It is all there now. Your lasagna looks DELICIOUS!! I love making lasagna, and usually make like 3 trays at a time. With 2 married daughters, the other 2 trays are spoken for before they are even made LOL. I love the spinach option…and I usually add a layer of “spinach” pasta. 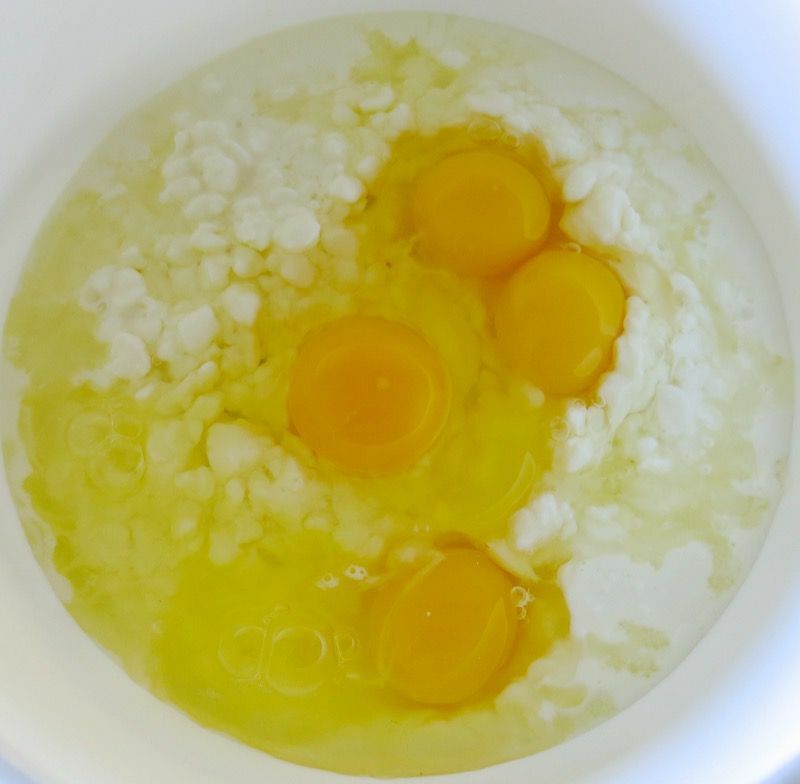 Sometimes to change things up I use feta cheese as well….yummy! Will try your recipe soon…thanks. Spinach Pasta would provide a visual contrast, too! Love feta, as well. Nice to hear that the spinach layer is a tradition in your family, too!!! I do make the spinach and white cheese lasagne (preferably ricotta, due to a degree of cow milk intolerance, though cottage cheese works fine). I don’t put a beef layer in lasagne. Not usually any meat, except perhaps a bit of ham. I live at the foot of Petite-Italie, Montréal, and the old Catelli plant on Bellechasse is nearby. It is mostly artistic and other “creative” businesses now. Nice old building, save unlike many of the old plants down there. How upset with myself I am! I was just in Montreal last month and I did not make the time to go to the old Catelli plant! I didn’t even think of it, and it is definitely a Canadian icon that I would have loved to have visited. Thank you for that reminder. 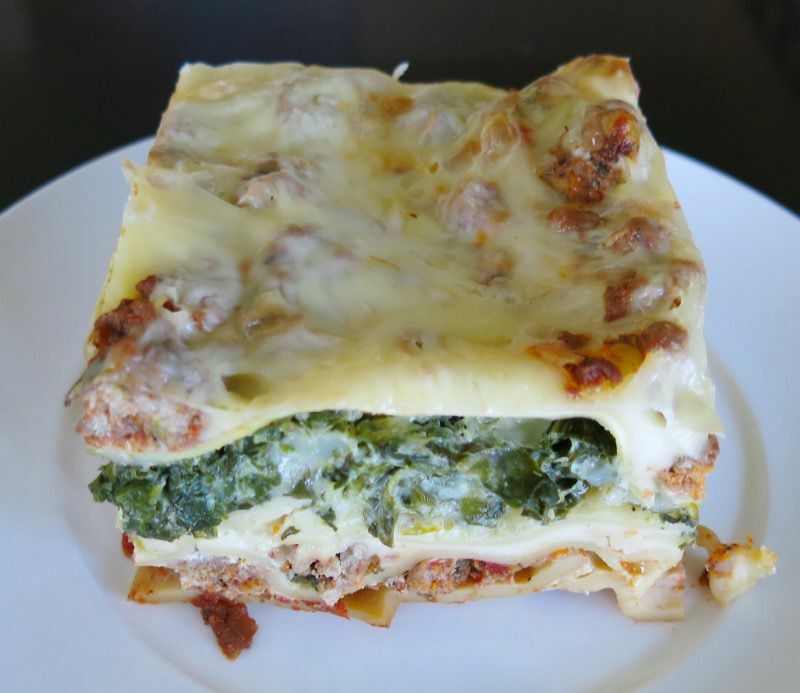 Your spinach lasagne sounds wonderful, too!There really is something about pasta, isn’t there – and “the Canadian way”! Thank you, Evelyn. 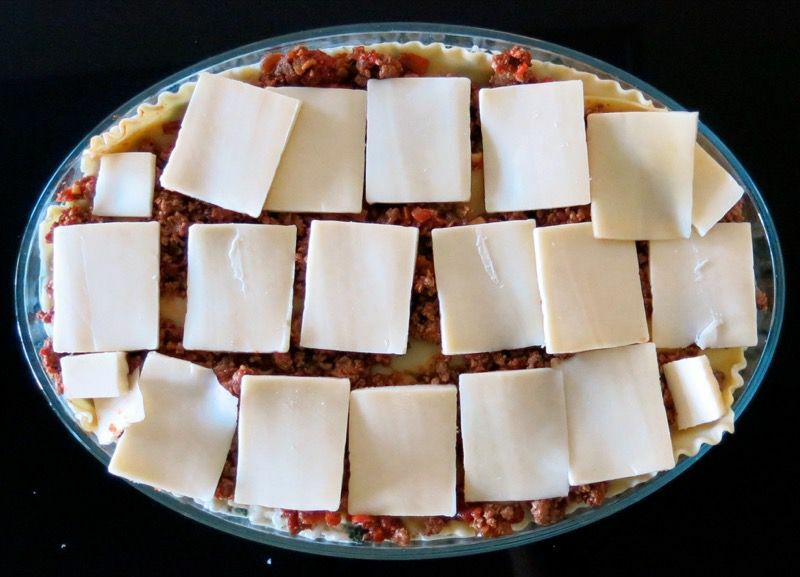 It looks much different that it did in my mind, but the beauty is how it inspired so many to make our Canadian Lasagna with a layer of cottage cheese and spinach! I saw your Traditional Canadian Lasagna on the side of my computer screen and checked it out. I never had this growing up as a kid in northern NS b/c my Dad did not like pasta. But my aunt made lasagna and every once in a while I would have some. She put the cottage cheese in, but not the spinach. 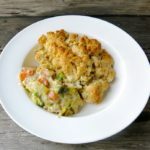 When I got out on my own, I rec’d a recipe like this from Canadian Living. I started subscribing when I was 17 and I am now 48. I still have the issue with the lasagna like yours on the front page. It was a late 1990’s issue and dealt with the Westray Coal Mine Disaster in the same issue. 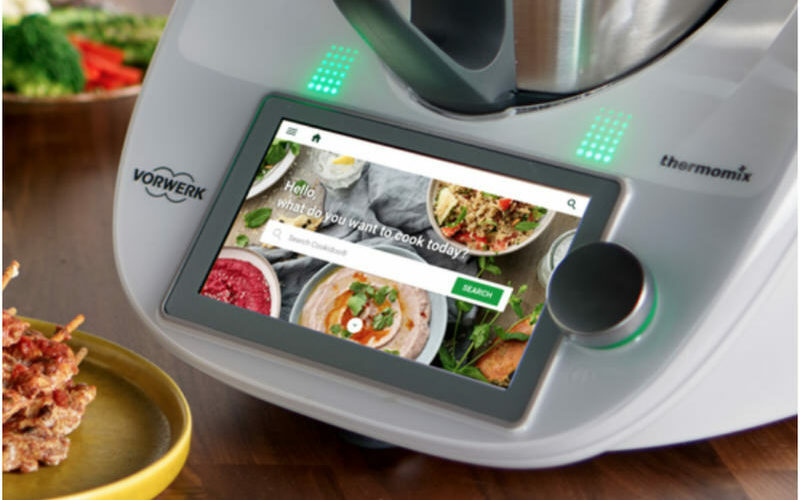 It has spinach and cottage cheese like yours. It takes a long time to make, about 3.5 hours, but it is worth every second. And when you told your readers to allow the waiting time when it comes out of the oven, you aren’t kidding. Mine doesn’t take 30 mins but I believe it calls for 10 or 15 mins. We have made the mistake of eating it right away and it is indeed a mistake to do that. The time to let it set is vital. Add homemade garlic cheese bread and you are set for an amazing meal! Thanks for sharing the history behind Catelli, Valerie. Have a great weekend. 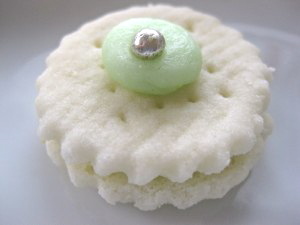 I am adding your articles to the recipe post shortly! Happy 2018 to you and thank you so very much for your story and for sending along your precious copy of the 1992 recipe from Canadian Living Magazine! WOOT! 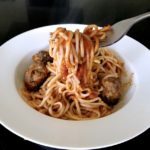 I just wanted to say that this recipe is excellent! I live on a small island off the northeast coast of Newfoundland and ricotta is unavailable, however cottage cheese is always on the grocery store shelves. I appreciate this recipe, and others that have simple ingredients but deliver big on flavour! A heartfelt thanks to you for chiming in and letting me know! So appreciated as fewer and fewer leave comments these days, so it is difficult to feel connected to one’s readers! I LOVE Newfoundland – the small portion we visited in May of 2014 – we were there 10 days only – not nearly long enough – St John’s, Trinity -and round about those areas only. The best people in Canada, I dare say! 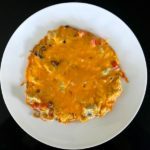 I am so interested in local regional Canadian food and would love to have you share any NL traditional family favourite recipes with me… I have already posted a few: cloudberry jam, cod tongues, toutons… partridgeberry salad. I am a curious gal! Isn’t that the truth, Tobi? 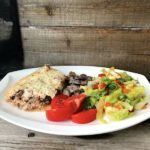 “What is traditional Canadian anything – let alone lasagna!” That is one of my goals and has been for over 10 years now with this site – to document regional traditional Canadian food and recipes. I so appreciated reading your comment! Thank you so much for making the time to chime in. 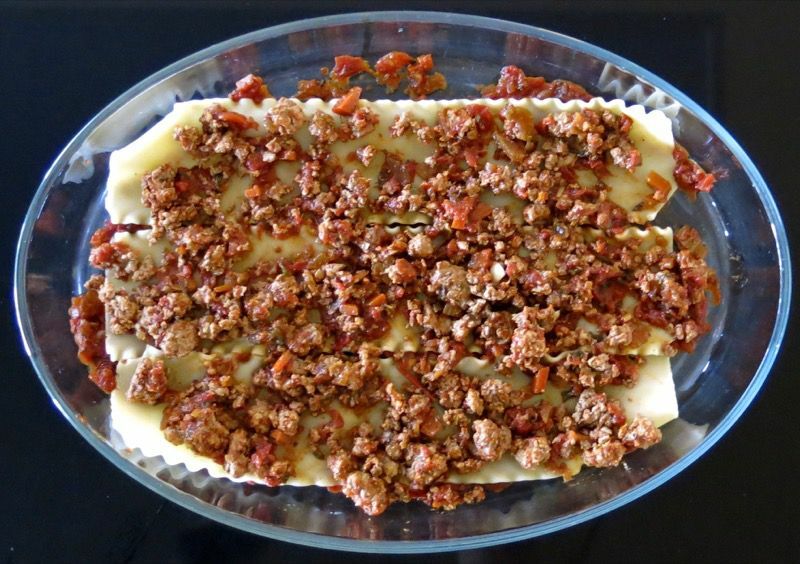 This is the lasagna recipe I remember growing up with in Alberta. I think I still have the cutout from a box somewhere, that my mom used, but I am so happy to have found it online! I still make it! It is not the only one I make, but it is the only one I have made repeatedly as it continues to be our family favourite! 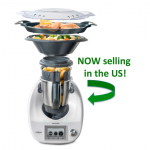 Let me know how the recipe works for you! 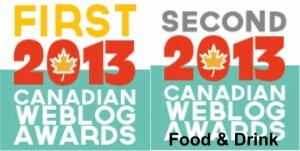 Lol… Enjoyed reading this… Title of “Canadian lasagna” caught my eye, and with curiousity I had to read the post. My mother was a good but very basic cook with about 10 – 14 different meals in regular rotation. There were a few dishes for special occasions, like baked beans or Christmas Eve tortier, but she never made lasagna. As I was the oldest girl in our family I became responsible for making many family dinners when mom went to work outside the home. I do remember making this off the catelli box, and continued with my own family for many years. I always made a large enough pot of spaghetti to ensure left over meat sauce to make lasagna. 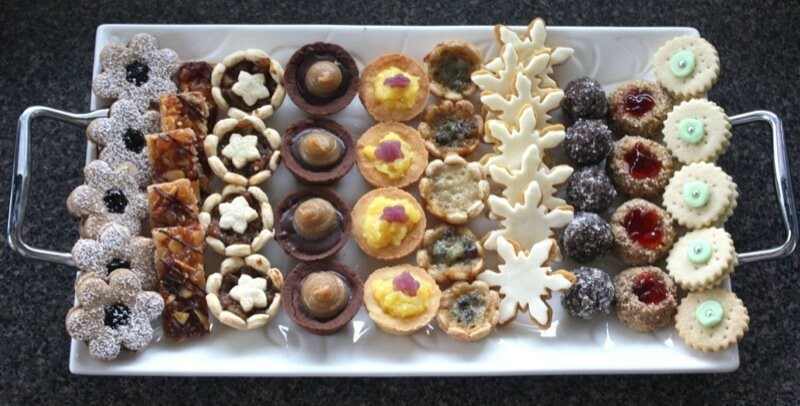 Eventually, due to 4 children and working outside our home the recipe was altered to suit. 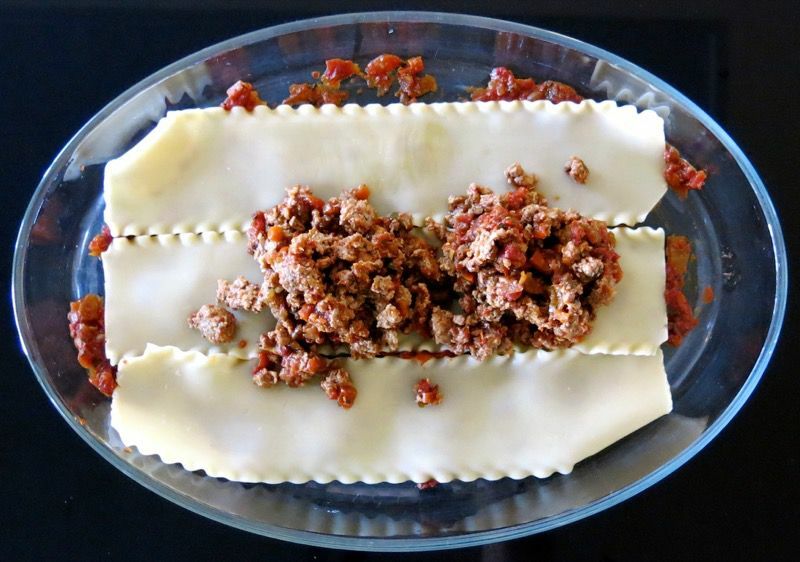 I would make the lasagna using the warm left over meat sauce that I added extra tomato to….to thin down a little then layered as usual, but used uncooked noodles. I covered and put in fridge overnight. Put in freezer the next morning for an easy meal another day. Still do it much the same way…..a few decades later! Thank you so much for sharing your stories and allowing us to re live old memories from a food perspective…funny how so many great memories relate to food… the kitchen really is the heart of the home! Do you still have the original recipe from the old box,I have been searching for it for a long time. I have several lasagna recipes but I am still looking for the first one from the box. Yours sounds right but not quite the same. Also ,I am trying to print yours with no success. I went to the post and the print is working just fine from my end? Try another browser? I sure did. 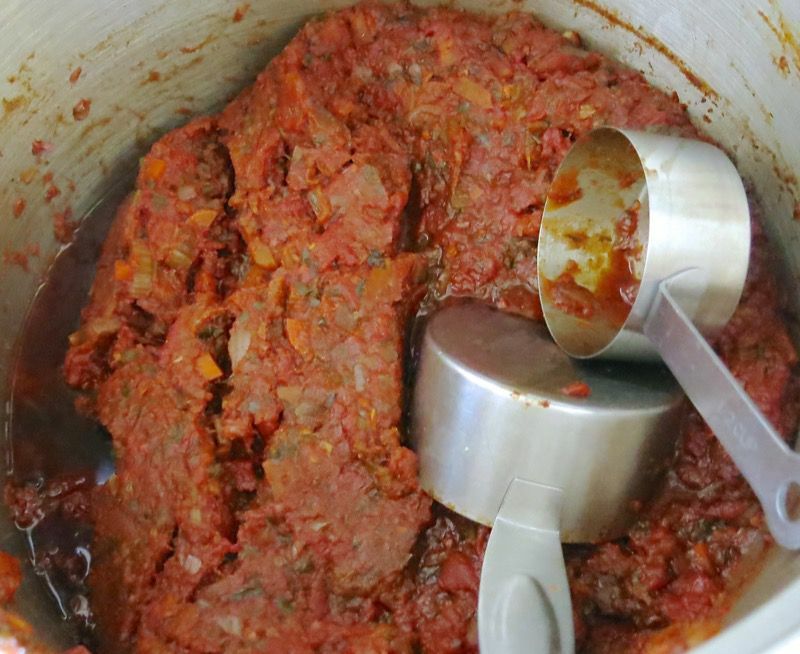 It’s called The BEST EVER HOMEMADE TOMATO SAUCE Hope this helps, Sandra! Let me know!